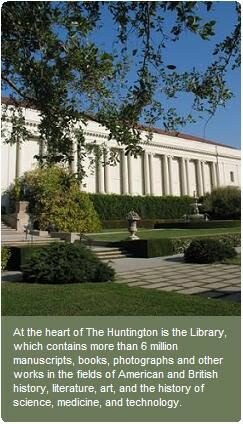 As of this writing (8/18/2010), no one has signed up for the Huntington Library & Shopping Tour. Because of this, the IC committee has decided to cancel it. Thanks! In the morning departing to Huntington Library. Spend the morning touring the library, art collection, and botanical garden. Leaving the Library around noon to the mall for lunch. Free leisure on your own for lunch and shopping. Pick up at 5:00pm and go back to the hotel. The Huntington, the former home of a railroad tycoon, is many things - an extensive library filled with rare books, a large art collection containing numerous European prints and paintings, botanical gardens of almost unmatched splendor, and a forum for regular lectures and other activities. You will also find a fine bookstore, cafe and tea room on the grounds. Come and wander through the 150 acres of colorful gardens, lily ponds and beautiful sculptures. The rare books and manuscripts in the library include some of the earliest editions of Shakespeare's works, a copy of the Gutenberg Bible on vellum and the Ellesmere manuscript of one or more of Chaucer's greatest works. Please visit www.huntington.org for more details.